DockATot comes in two sizes: Deluxe, for newborns to nine months, and Grand, for babies nine months to three years. Each size is designed to aid your growing child through key developmental stages, and truly helps them sleep more soundly. The Deluxe lounger mimics the womb – creating a safe sleeping spot, and prevents flat head syndrome. It’s also perfect for diaper changes and for getting their tummy time in! The Grand boasts the same benefits, and is also perfect for the later transition from cribs to big-kid beds. Offering more than standardized baby loungers, the DockATot has been carefully constructed with your baby in mind. 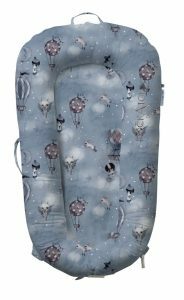 One review tastefully states “I’m convinced there is magic fairy dust sewn into the DockATot!” Fairy dust or not, these loungers are embedded with temperature control that doesn’t harbor heat. Because of the special hygienic fabrics, your child is prevented from becoming sweaty. The loungers are crafted with the highest quality of breathability and non-toxic materials, allowing for maximum comfort and convenience. The website also boasts a thorough list of safety certifications and standards, which ensures that your child’s safety is a top priority. 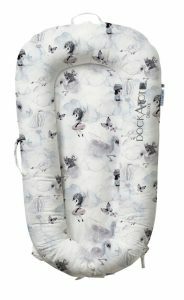 Whether you are are an on-the-go traveler, or simply taking your baby to grandma’s so you and your spouse can go on a long overdue date night, you’ll find it easy to tote your DockATot. Not only are these loungers lightweight, portable, and super easy to travel with, they are very stylish! There are a variety of different covers that truly make your lounger feel customized for you. Made from 100% cotton, DockATot’s covers are washable and durable for the messier moments in life, too. DockATot is a must-have for any child or toddler. Give your little bundle of joy the ultimate celebrity baby treatment and see for yourself how revolutionary these loungers are!